1. Send someone to call 911 or your local emergency number. 2. Lean the child forward and make 5 blows to their back with the heel of your hand. 3. If this does not work, stand behind the child and wrap your arms around the child’s waist. 4. Make a fist with one hand. 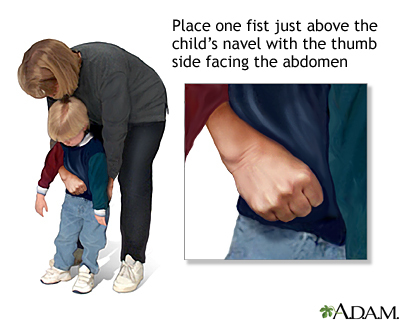 Place the thumb side of your fist just above the child’s navel, well below the breastbone.